As an ACE (American Council on Exercise) certified personal trainer with over thirty (30) years experience in the health and fitness industry as a Fitness Director, Health Club Manager and personal & fitness trainer, one thing became very clear early in my career and that was the need to educate my clients on nutrition as well as exercise. 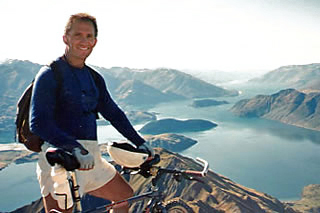 David Peters, founder and owner of Blender Culture, at the top of Mt Roy overlooking Lake Wanaka, South Island, New Zealand. I formulated Blender Culture because I fell in love with super green food blends and wanted to create a high quality formula containing no filler ingredients as was common practice in 1999. I have been on a life long quest for anything that will contribute to my vitality and longevity. I am personally committed to providing a highly nutritious, great tasting food supplement that is high in naturally occurring antioxidants, supportive to the immune system, cleansing and detoxifying. Blender Culture is manufactured in small batches under the strictest of protocols at Organic By Nature in Rancho Dominguez, California with over 20 years of experience in manufacturing, Organic By Nature is a certified organic, Kosher and GMP (Good Manufacturing Practice) facility with skilled and experienced specialists who are committed to providing high quality premium supplements. Blender Culture is tested and retested including micro-biological analyses for purity before being released for shipment. This assures a product of the highest quality produced under the highest standards available. Organic By Nature, Inc. founded in 1993 quickly became recognized for setting a new standard of purity with cutting edge plant based nutritional products and focused on finding nature’s most potent natural sources of phyto-nutrients revolutionizing the way they are concentrated into non-pasteurized stable powders. Organic By Nature, Inc. has built a reputation on being a superior source for all green food ingredients. Focusing on non-GMO ingredients, OBN has expanded their raw material offerings to include superior algae products, vegetable powders, fruit powders and sprouts. Today, over 200 companies trust OBN to provide them with private label products, packaging services and raw materials. The cat in the foreground of the label is Mango. The dogster on the side is Sasha the wonder dog. Sasha the wonder dog made it to the age of 16 still running in the hills with me. Her doctor said her diet of green powder, raw food and exercise added about four years to her life. Blender Culture is about cooperating with each other and Mother Earth, recycling, sharing, caring, accepting, supporting and being kind. It’s about conducting business with a win-win attitude. 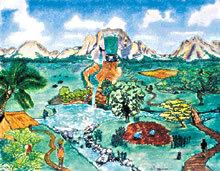 It is up to the individual to support organic farming, and in the end all will benefit as we move forward as a society. We support and encourage you to support organic and transitional farming. 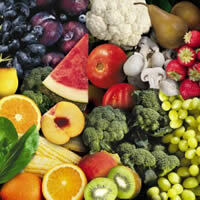 The money saved when purchasing foods that are not pesticide-free is extracted from the earth and your health. Mother Earth suffers; we all suffer. Blender Culture as a company is committed to supporting organic, transitional and pesticide-free farming. To my closest friends I am known as "the green guy". Eat green foods, live long, prosper and be well!! !